“In Protestantism there is a strong tide of denying the Lord’s name by replacing it with many other names, such as Lutheran, Methodist, Baptist, Presbyterian, etc. Many Christians say that they go to the Lutheran church, the Methodist church, or the Presbyterian church. There is also the Episcopalian church, the Anglican church, the Church of England. The word Episcopalian is from the Latin word episcopus, meaning bishop. The Church of England is a state church under the rule of bishops. We can see that Protestantism has replaced the unique name of Christ with many other names. Today it is very convenient for people to set up a church and give a name to it. There are many Chinese churches in California with many names other than the name of Christ. One denomination calls itself the Taiwan Presbyterian Church. Another one is called the Taiwan Gospel Church. 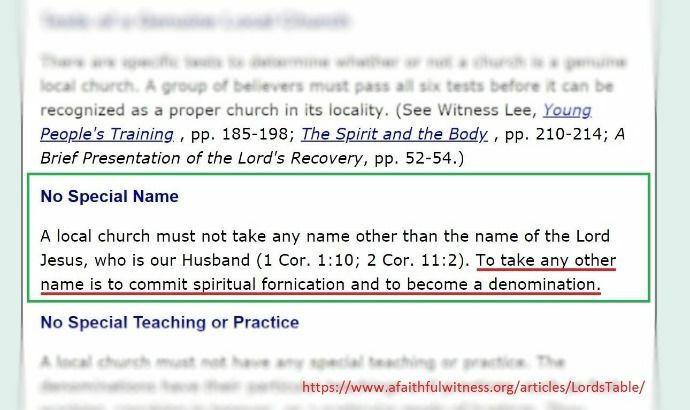 To denominate the church by taking any name other than the Lord’s is spiritual fornication (emphasis added). The church, as the pure virgin espoused to Christ (2 Cor. 11:2), should have no name other than her Husband’s. All other names are an abomination in the eyes of God. I personally do not affiliate or belong to a denomination, but am in a non-denominational church where I am in a fellowship with other Christians. “Denominations”⁶ are not inherently sinful. What's sinful is theological error, such as is found in pseudo-Christian teachings such as Catholicism, Mormonism, Jehovah's Witnesses, Iglesia ni Cristo, Ang Dating Daan, The Kingdom of Apollo C. Quiboloy, etc. But nevertheless, whether or not I belong to a denomination, Witness Lee has gone beyond what is written (1 Corinthians 4:6) in his assertions from the above texts based upon his exposition on Revelation 3:8. Aside from it, there are certainly a few theological errors in his surrounding exposition on the seven churches in the book of Revelation.⁷ However, I will only be focusing this point of error under the headline of my polemical paper. First of all, the names do not actually replace the name of Christ. They are simply descriptors showing the emphasis on their particular gathering or structure. The name "church" is still there so there is no "replacement" going on. There are a few problems with Witness Lee's analogy of a married couple. If Mrs. Jones is Mrs. Jones, she is Mrs. Jones no matter what she calls herself. You are what you are regardless of what you call yourself. If I am a woman who is married to Mr. Jones but I call myself something else, that doesn't change the fact that I am married to Mr. Jones. (Also strictly speaking, the church wedding of Christ hasn't occurred yet, the wife doesn't take the name before the marriage happens⁸). Lee’s analogy uses one culture's practices and applies it to a spiritual reality. A wife taking her husband's name is not actually biblical. Where in the Scripture does it say that a wife is to take her husband's name? It doesn't! That is just a matter of culture. People in Bible times did not really have last names like we think of last names today.⁹ Ironically, Lee's own culture is a prime example of many, many couples keeping their own names. You are still the wife even if you do not take your husband's name. Taking the husband’s last name is not an indicator of the reality. Additionally, where in the Bible does the church "take the Lord's name"? We see Christ and the church (Ephesians 5:32). We don't see Mr. and Mrs. Christ. Christ is a title, not a last name. Christ and the church are always just that.....Christ and the church. If a local church named herself as the church of Buddha, practices yoga, performs witchcraft, elevates and idolizes a finite man, and delves into eastern mysticism then that would be unequivocally spiritual fornication!¹⁰ The true church of Jesus Christ still has only one husband. A false and professing church is no church at all. The Old Testament is replete with examples those under the Old Covenant sinning against God and committing harlotry by worshiping false gods. They were commanded to repent or faced punishment by God. The same can be expected under the New Covenant, the church. We are called to cling to Christ or be broken off like rejected branches (John 15). Orthodoxy is not determined by the name of the church or the so-called proper ground of the church (Lee’s doctrine of ecclesiology, see note 1 below). It is by its faithfulness to the doctrine of Christ preached by the His apostles (which is basically founded on the New Testament) and how consistent the church's life and practice is to the doctrine of Christ. Of course, there are churches that are more consistent than others in terms of their faithfulness to the doctrine of Christ and their conformity to His Word in actual life and behavior. But who could really say that there is one church that is so perfect, undiluted, and free of error, in this life? The final judgment is not going to be based on the name of one's church, is it? Ultimately Christ will base His judgment upon whether or not we have put our trust in His once-for-all finished sacrificed for our sake, have kept the faith once for all delivered to the saints, and we have, by the grace of God, lived a life consistent with his profession of faith, one that is pleasing in God's sight, that is, in holiness and godliness. Taking the name of Christ is the same as hallowing or sanctifying or glorifying the name of God. How do we do that? By loving Him and keeping His commands as our thankful response to the grace He has given us, undeserving sinners. "The church of God in Corinth” (1 Corinthians 1:2) is a fully legitimate name used in the Bible and could arguably be said to be taking the Lord's name MORE than "the church in [locality]". Is Lee accusing The Church of God or the Assemblies of God as spiritual fornicators because they are not under his ministry? If so, why? In the beginning of the book of Acts, the church simply called itself 'the Way' (Acts 9:2; 19:9, 23; 22:4; 24:14, 22). No mention of Christ in that title at all, nor designated as "the church in [locality]". Does that mean the church was immediately unfaithful right from the day of Pentecost? Even when they did start being called Christians, it was meant to be a derogatory term from their enemies, so clearly the church in the book of Acts didn't think it was important to have a particular name. I was taught to avoid the "so-called table" of any other groups. Who are the real divisive ones then? They are proclaiming a oneness that is divisive and sectarian to the Body of Christ. Wouldn't "the recovered church" or “the church of recovery” be considered a denominational label that doesn't include the name of Christ? So hasn't Witness Lee just committed the same error he's accusing others of? This is a perfect example of a tu quoque fallacy. Simply that every movement (and thus its designations) conjures up positive images in its faithful followers which bespeak the best God has to offer. "Baptist" to a Baptist essentially means God's best, as does "Recovery" to an LCer. So they are more alike than LCers might want to admit. Certainly there is plenty of difference between the Baptist movement and the Recovery movement. Yet LCers would like to make vivid differences which, when you get right down to it, aren't much differences at all. Why is the name "Baptist" divisive and "The Recovery" is not? Simply put, because in the minds of LCers, the Recovery is something good and genuine and totally of God himself thus it cannot be divisive (no matter how much havoc it wreaks). While to them "Baptist" means something of old dead religion, and so could never be anything but negative. On the other hand, Baptists think the Baptist movement is where God makes his home, so, of course, they like to call themselves Baptists. But is there really any difference? No, there is not. So, if an LCer says by calling himself a Baptist a person is divisive, he must also say that by calling himself a person in the Lord's Recovery such a person is also divisive. Likewise if calling oneself a Baptist is not divisive, then one can say simply calling oneself a person in the Lord's Recovery is not divisive either. When a Baptist says "we in the Baptist church" is he really saying anything different than when a LCers says "we in the Lord's Recovery"? In essence, no. One is not necessarily more exclusive or divisive than the other. Designations are necessarily for communication. No matter how much they try to get around it, LCers designate and denominate themselves when they refer to themselves as being in the Lord's Recovery and others as not. Obviously, then, for communication purposes, denominating is unavoidable. The issue then is not denominating. The issue is what are the implications of the denominating. If a Baptist says, "I'm in the Baptist church because the Baptist beliefs to me represent the best God has to offer right now," then the Baptist is doing no differently than what LCers claim they are doing. Neither should be held at fault for doing this. But if a Baptist says, "I'm in the Baptist church, and you are not, so you are not in God's move," then that is an exclusive implication of the denominating. This in fact is what many LCers and most staunch LSMers do. It is practically by definition sectarian. So LC/LSMers in an attempt to claim special status try to draw all kinds of superficial differences between their names and the names of denominations (e.g. saying the name is really a "description"; making an issue of signboards, etc) but fail to see the essential similarities. On the other hand, they do not see the deep and essential exclusivity of claiming that those not in the Lord's Recovery (their movement) are not in God's move, while pointing an accusing finger at the superficial exclusivity of some modern denominations. Essentially, Lee is misrepresenting the matter. Paul indeed, did not like people saying, "I am of Apollos," or, "I am of Paul." Yet, he did say, "Follow me as I follow Christ (1 Corinthians 11:1 MEV)" So, for starters, it is not wrong to follow men, the question is, are the men we are following, themselves, following Christ? What Paul is getting at is unnecessary division, over and against necessary. Notice that Paul says in 1 Corinthians 1:14-16, "I thank God that I baptized none of you except Crispus and Gaius, so that no one may say that you were baptized in my name. (I did baptize also the household of Stephanas. Beyond that, I do not know whether I baptized anyone else.)" This is because people were taking sinful pride in who they were baptized by. Thinking that if they were baptized by someone special, they themselves were special. And Paul's point was that, in short, baptism is about being baptized into Christ, and nothing else. This is not the same thing as agreeing with Paul's teachings, when false teachers come along teaching the opposite. Further, this version of "no creed but Christ" idea is problematic. If one man stands up and teaches heresy, (like Arius did, thus creating the teaching called "Arianism") and another stands up, like Athansius, point to Scripture and saying "I follow Scripture" won't work. The person would either be ignorant or dishonest. For, both Arius and Athanasius declared to be following both scripture and Christ. We, however, must adjudicate between the two, as to which one is right according to Scripture. And when we do, it is because we believe what that person is teaching or saying. And thus, we are "following" as people put it. They absolutely follow a mere fallible man’s ministry without reservation instead of Jesus Christ, whose Word is to be the only sufficient, certain, and infallible rule of all saving knowledge, faith, and obedience. They are not aware that idolizing and elevating a man’s ministry is spiritual fornication (according to them) whether they admit it or not. To say that to denominate a church is spiritual fornication, is purely a fabrication of Lee's making or an eisegesis¹⁴, without any scriptural basis. Denominations did not exist during John’s time when he wrote the book of Revelation. There is some sense of truth to what Lee writes in the above text, but this interpretation of “have not denied my name” is quite far-off from context. What did Jesus mean by, “have not denied my name” in Revelation 3:8? God has set before the Philadelphians an opportunity (open door). Some believe this open door was a unique opportunity to preach the Gospel: "may design an uncommon opportunity of preaching the Gospel" (John Gill Commentary), "for evangelization" (Commentary Critical and Explanatory on the Whole Bible) "Probably it means here a good opportunity for missionary effort in spite of the Jewish hostility." (Robertson's Word Pictures in the New Testament). This open door was a door that no one could shut. The reason no one would be able to shut this door is because the Philadelphians were a group of "little power", which is most likely a reference to their size as a congregation, or their influence in Philadelphia. They also had "kept my Word" which is likely a reference to them keeping the Gospel pure. The keeping of the Word and the name of the Lord shows some form of faithfulness from the Philadelphians. For the same verb “deny” see Matthew 10:33; Luke 12:9; 2 Peter 2:1; Jude 1:4. I know the life you live. I know that you have only a little prestige. You have obeyed (or, followed) my commands and have not said that you do not know me. Look, I have opened a door in front of you which no one is able to shut. It is only Witness Lee who offers such a unique and foreign interpretation of "have not denied my name" in Revelation 3:8 from all of the commentaries out there. Therefore, not denying His name is speaking of apostasy, not denominating a name for the church! Denying Christ’s name is denying everything that is wrapped up in who He is. They have not denied His Lordship and salvation. This was in reference primarily to the Roman persecutions at the time in which professing Christians were called upon to deny Christ and make an offering to Caesar. Those he was referring to had not done this, but had stood firm against this pressure. 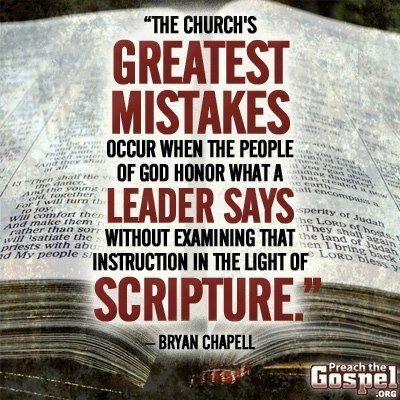 Similarly, it applies in principle to those who are likewise tempted at any point in church history. Conclusion: Denying the Lord's name is a common theme in the New Testament. If you are ashamed of Him in this age He also will deny you to His Father (Matt. 10:33). Likewise, having any other idol other than the Lord is a very serious sin also repeated in the New Testament. To "deny" the name of Christ was related to denying association with Christ in the face of persecution on those who were followers. Not only to save their lives from execution, but to avoid being outcast in society in general. Many Christians during the times of more severe persecution are not ashamed of openly preaching the gospel with boldness in the streets of Philadelphia. But there is nothing that suggests that denying His name is to denominate the church by taking any name other than the Lord’s is spiritual fornication! This is purely an eisegesis! This can be also found in a footnote from the Recovery Version online on Revelation 3:8 and from the Open Letter: To the Leadership of Living Stream Ministry and the "Local Churches" website under the Legitimacy of Evangelical Churches and Denominations. It appears that Defense Confirmation Project (DCP), a project to defend and confirm the New Testament ministry of Watchman and Witness Lee and the practice of the local churches, did not address or answer about the “denominations as spiritual fornicators with the whore of Babylon” (Roman Catholic Church) in response to the Open Letter from these prominent Christians scholars and ministry leaders. I notice that from my own observation over the years after I left the Local Church movement, it seems Lee's statements would be misunderstood by those who criticize him. His eastern mindset and non-English-native language combine to make some of his statements appear to mean one thing, when a lengthy assessment of his work actually suggests something else. But nevertheless, those radical statements above are quite plain to read. The fact that the church, though not yet actually wed to Christ is nevertheless already "betrothed" to Him, which is already very binding as compared to our present cultural "engagement" arrangement. I don’t preferably identify with labels other the name of Christ but in a growing world of heresy, it is important to distinguish truth from falsehood. Given the example that someone calls himself a Calvinist, it doesn’t mean the Christian is an ardent follower of John Calvin or he was baptized in the name of Calvin. Calvinist doesn't mean Calvin himself, it is just a useful term, many others taught the same doctrines. By saying that one is a Calvinist, one is simply saying that one agrees with his interpretation that God is sovereign over salvation in Christ which is a biblical view of salvation. God's glory is the supreme meaning behind all things. Majority of Calvinists do not agree everything what John Calvin taught. Thus, calling oneself a Calvinist is not in a strict sense a follower of John Calvin nor is it an allegiance to a man. Re: Are All Christian Groups Spiritual Fornicators? I'm no scholar in writing this paper. But I have gone deeper study on this issue. Why did I decide to write this response? The LC leaders have mouthed me against my current church as a spiritual fornicator. Now I pointed out the inconsistencies, and logical fallacies as well as that there is no biblical warrant for a church name and the bad use of the Revelation 3:8 passage. Please do consideration that English is not my primary language. Kevin, very nice article. I myself can't write such well-constructed arguments, because my attention span is too short probably, but I welcome others. Thanks for making the effort. 1. I agree that if Miss Jones marries Mr. Smith and keeps her name, then she can still go to church and nobody will say anything. I have seen this in the Lord's Recovery. Often the woman has some professional standing and wants to keep her name. Nobody says a word about it. But they receive Witness Lee's teaching as if it was valid. It is not. 2. I asked the Lord's Recovery church where I met, why they had to take a name and register with the government as a 403(c) organisation. They said, "We have to". Huh? No you don't - where in the NT does it say that you have to register with the government? Talk about Pergamos - married to the world! Why condemn others if you do it? 3. The irony with the Lord's Recovery is the names that sprout so easily there. Christians on Campus, Affirmation and Critique, Lord's Move to Europe, Living Stream Ministry, Continuing Steadfastly, Bibles for America (and Russia and Germany &c), Defense and Confirmation Project, Full-Time Training Centres and so forth. Every 7 or 8 months you'd see a new name come out... some new ancillary named and publicly-registered non-profit entity would appear. "But it's not the church". Kevin I encourage you to write more. The more you write, the more you will know the truth, and the truth will set you free. The Recovery program is filled with hypocrisies. Don't expect their leaders to accept anything that you write. The Lord often confronted these hypocrites in the Gospels. Apparently none of them were convinced by Jesus either. Well done! Keep doing this. Your insights are helpful. The "wife only takes the name of the husband" analogy is as you said a cultural not biblical phenomenon, so it is a meaningless argument. It's even worse than that. Wives take their husbands last name, but keep their unique first name, which even the husband happily uses. So "ABC Community Church" could be seen as an identifying "first name" with the surname still "Christ." Either way, Lee's argument falls apart upon examination. As much of his teaching, it only impresses an audience that feels they have no choice but to believe it. As you imply, distinctions are not division. Division, in fact, is not what "ABC Community Church" does by having its name, but what the LR does by discounting groups like "ABC Community Church." They are masters at straining gnats and swallowing camels. All of the LR's teachings about "oneness" are really not about oneness (though they have convinced themselves they are). They are about a scorched earth policy of discrediting every group other than themselves. They really feel the Lord is better served by everyone agreeing with and joining them, so to them that end justifies any means they use. This is at the very least frightfully arrogant and at the worst dangerously deluded. The LC elders refused to listen to what Scripture is trying to say. Jesus is commending the church in Philadelphia for not loosing faith and remaining loyal to him. That's the point of what Jesus getting at. Having a denomination doesn’t make you loyal to that teacher who started that denomination at the expense of Jesus himself. Witness Lee's critical view on Christianity is an attempt to deceive many precious people to make them believe that there is nothing good in Christianity than the Lord's Recovery movement. Kevin, you should note that the ground of locality was never properly learned from scriptures, rather it was used by Nee in China during the early 20th Century as a means to declare indepenence from Western missionaries. I found this a little disconcerting since these missionaries sacrificed their lives to bring the Gospel to them. In the genesis of this movement one should appreciate the degree of anti-Western sentiment behind it. Both Nee and Lee's parents were Christian and were persecuted. Nee's 'local ground' proposal, learnt from Darby et al, seemingly cut the Gordian knot and they streamed in by the tens of thousands. But as Breadfish noted, any who critically examine the teachings got shunted aside and the mass became 'yes robots'. We now see imperialism redux as exported Chinese-flavored churches emerge. In some western communities the Chinese-speakers are so prevalent that they've segregated themselves from the natives. As long as they call it a "meeting" and not a "church" they presume propriety. But guess what - the NT Greek has the same word for each. Ekklesia. If the Lord's Recovery's basis or ground is judgment and condemnation of others for spiritual fornication, then how will they find the means for repentance and forgiveness when they're similarly found? I mean, who is without fault? A lot of folks from the LC who knew me personally have expressed their disappointment towards me for pointing this error. They "hung up" on the "name." I find that anyone who is narrowly focused on "the name" is someone who is off track. It is a "red flag" of warning: watch out for those who make a big deal about the "name." Giving a "name" to a local church is NOT deserting the Lord's "name." It is not spiritual fornication to leave a local church if there is a problem. Problems cannot always be solved due to the flesh and spiritual warfare. Here I stand. I am challenging those who are in Local Church of Witness Lee to reconsider their doctrinal views if their views are aligned with Scripture. Sadly, they don't speak for sola scriptura and tota scriptura! They adhere to Scripture + Experiences + MOTA. Are you suggesting that Western missionaries were involved with the persecution of the Nee and Lee families? Nee's 'local ground' proposal, learnt from Darby et al, seemingly cut the Gordian knot and they streamed in by the tens of thousands. I've said before that the "local ground" doctrine was intended to invalidate all other groups as much as it was intended to validate Nee's group.